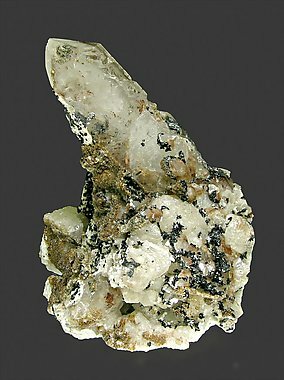 Spheroidal groups, very rich of small, black, very bright crystals in oriented growth on a matrix of very sharp, tabular crystals of Fluorapophyllite-(K). The specimen is more esthetic than usual for the species. 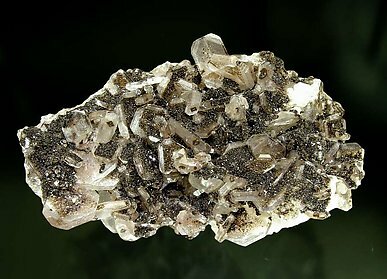 It has a base of Quartz crystals with white rhombohedral crystals of Calcite and a coverage of Fluorapophyllite-(K) and black prismatic crystals of Manganilvaite, small but very well defined. We’ll send the analysis of the Manganilvaite to the buyer.